One of the best experiences I've had. Great personable crew. Captain Manny and Hunter were just the best. My husband caught an 80 inch Sailfish with the talent and guidance of this crew. I would highly recommend going out for deep sea fishing with them. Very professional and knowledgeable. Very nice people. Made me feel right at home. This was my first time sea fishing. We went we a group from work for a team building event. Of the 15 of us, only 3 didnt catch something. We got numerous Kingfish, a tuna and a 6 ft Golden Hammerhead... WOW! Jay and Hunter were awesome, they told us about the area on the rise out, made sure we were all superbly taken care of. If you are in Miami area, I highly recommend this team. We spent half day fishing with captain Jay and Mike. They were great! They helped us with the fish (big and plenty), and cheered my son for his successful catch. We had an unforgettable day. Highly recommended. I just want to say that my family's trip with Capt. Manny and Billy was the highlight of our trip to Miami Beach. The Spellbound was just an amazing charter fishing boat and the crew could not have been friendlier and more informative and the fishing was amazing. The entire process of booking directly online, arriving at the boat and getting to the fishing grounds could not have been easier ! Join Captain Jay and his crew for a great day of fishing. The ALL NEW 57’ SPELLBOUND, offers the best deep sea fishing charters that Miami has to offer. 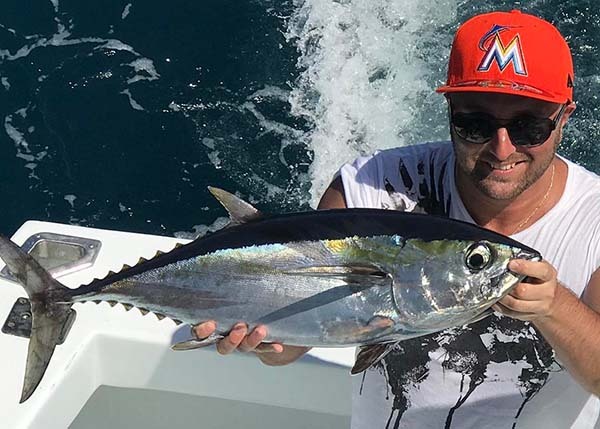 Enjoy our Miami fishing charters on all of our new modern sport fishing boat that can accommodate up to 20 people.We offer sport fishing charters for all levels of experience. We offer the best in customer service and the knowledge to serve the needs of beginners to experienced anglers. Bring the family, have an outing with the boys or girls, bachelor/bachelorette parties or corporate events, the SPELLBOUND is your perfect choice to catch the fish.On any given trip, depending on where you want to fish we can catch Sailfish, Mahi-Mahi, Swordfish, Tuna, Wahoo, Tarpon, Grouper, Snapper and more… Book a half day, ¾ day, full day trip or a daytime swordfishing excursion. The SPELLBOUND offers something for everyone.We are located at the Haulover Park Marina which is very close to South Beach, downtown Miami, Sunny Isle and Adventura. We are also close to the fish as the fishing grounds are just minutes away from the dock. Captains Jay and Manny have been childhood friends and have a combined experience of almost 60 years of experience. 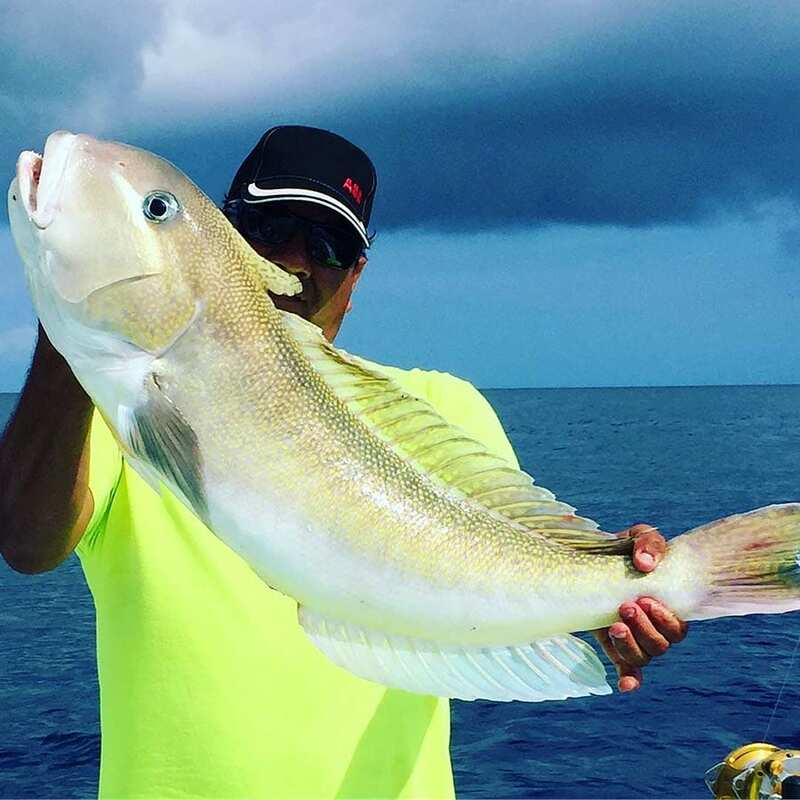 Well rounded with lots of tournament experience and I.G.F.A records Captain Jay and Captain Manny can not only take you to where the fish are but they can make your day on the water an experience of a lifetime. You might even catch an I.G.F.A record yourself. Whether you are looking to spend a few hours fishing or fish the entire day, we have you covered. If there was a favorite fishing spot in the world it would be Florida and the waters of Miami is an angler’s paradise. 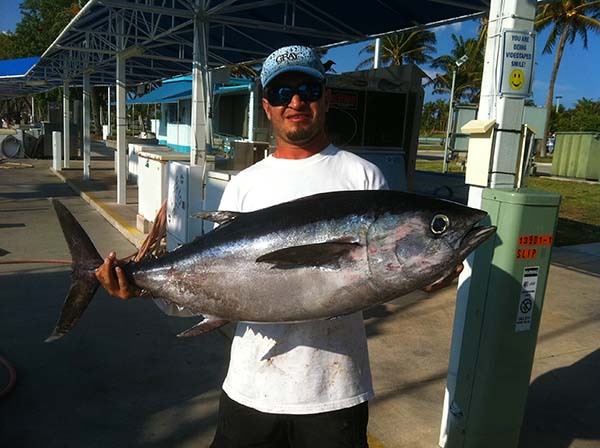 With a location so close to the Gulfstream fishing in Miami is some of the best in the world. Miami’s waters are thick with fish. Big Game pelagic fish like the Blue Marlin, Sailfish, Swordfish, Wahoo, Mahi-Mahi and Tuna are found in the deep waters while Grouper, Snapper, Kingfish, Cobia and Sailfish in the shallower waters just off the coast. With this diversity of fish, it is no wonder that Florida is called the fishing capital of the world. 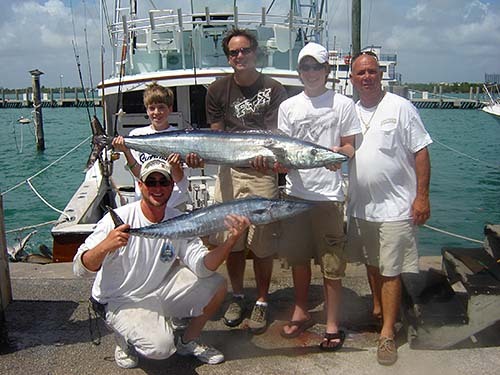 Offshore fishing involves running further offshore in or near the Gulfstream. Many might think that this would be miles and miles from shore and in the Northeastern part of the United States it is 100 miles out but in reality, it is only two miles off the shores of Miami Beach. Many of the fish that anglers look to fish for live in the warmer waters within the Gulfstream’s current. This means that the Tuna, Marlin, Swordfish, Sailfish, Wahoo, Mahi-Mahi and other fish are located just a few minutes away. Fishing methods vary depending on what you are looking for but the method most used is trolling. Trolling is having one or more fishing lines are in the water at one time baited with either lures or bait fish while the boat is moving. Trolling is a great method because it covers a lot of area and the more chances of getting on the fish. Trolling is great for catching; Mahi-Mahi, Tuna, Wahoo,Kingfish, Barracuda, Sailfish and the elusive but fun to catch Billfish. Another method is for the Captain to troll around looking for birds and debris. This is a good indicator of fish in the area. This method is great for Mahi-Mahi. 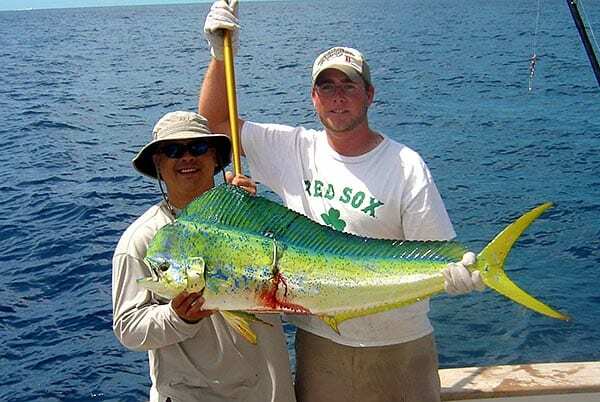 The Mahi-Mahi are best caught during the summer months but their season runs from early April to Late September. 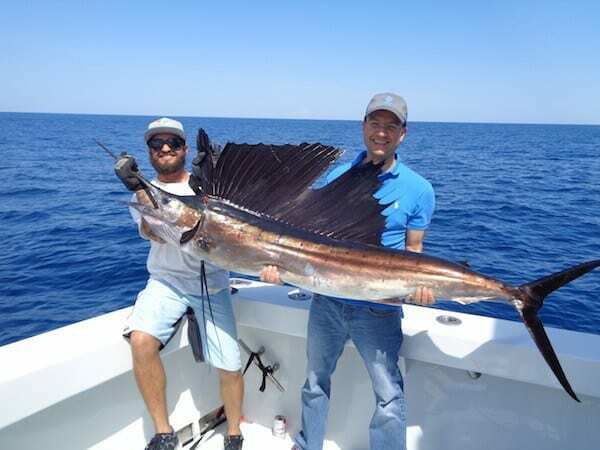 November to May is the time to come down to South Florida for your best chances to hook a sailfish. The winter months of December to February are the optimal months. 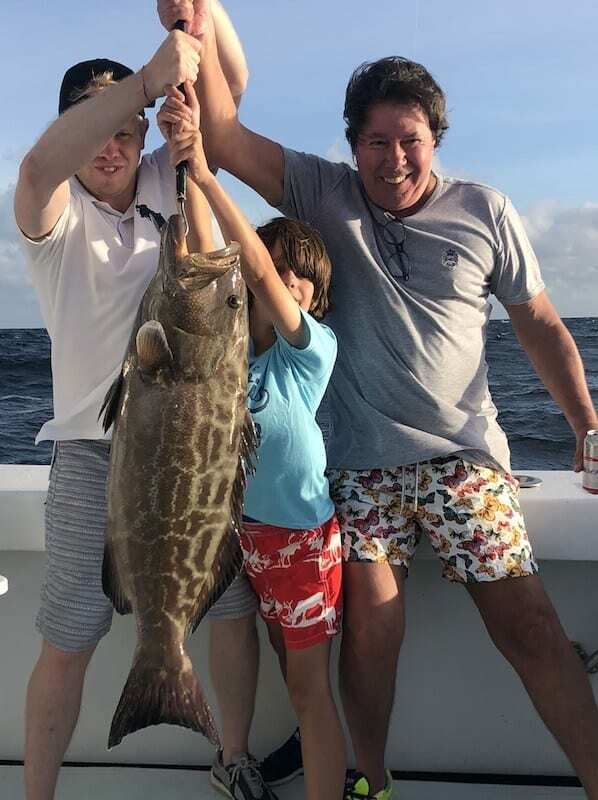 One of the easiest ways to catch fish in Miami is fishing the reefs and wrecks, both the real shipwrecks off the coast and the artificial wrecks sunk to improve the fish population. Fishing on the reefs and wrecks we catch a lot of different fish. With the methods we use; live bait, jig fishing, chicken rigs and kite fishing you can expect to catch Groupers, Snapper, Jacks, Cobia, Mackerel, Barracuda and Sailfish. 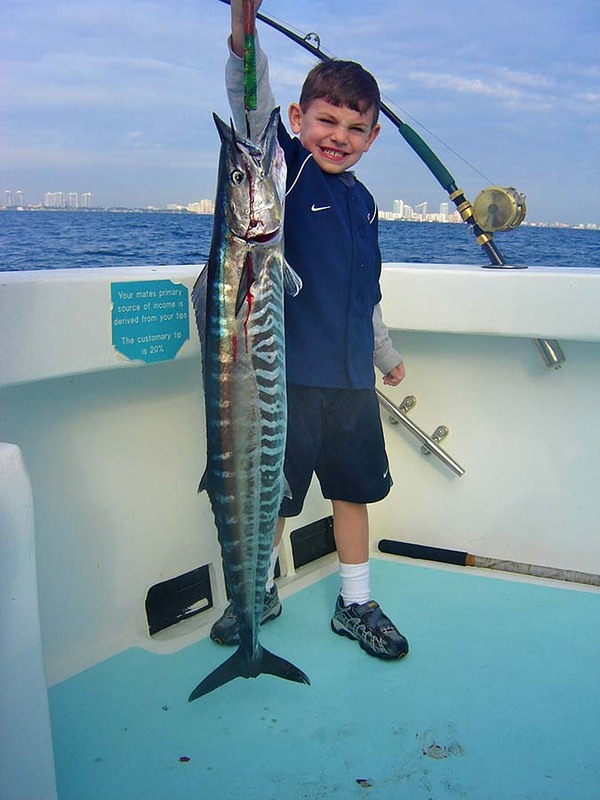 We fish in waters from 35 feet to 400 feet which are only minutes away from the Miami shoreline. Make a memory last a lifetime!! Catch a monster in the deep water or have a casual day with friends or family on the reefs, Your adventure starts now on the SPELLBOUND with Captains Jay and Manny!! Captains Jay and Manny believe and know that the future of this sport is in our children. They are experts in taking your kid fishing. Teaching them the basics and watching the love of fishing grow in their eyes. 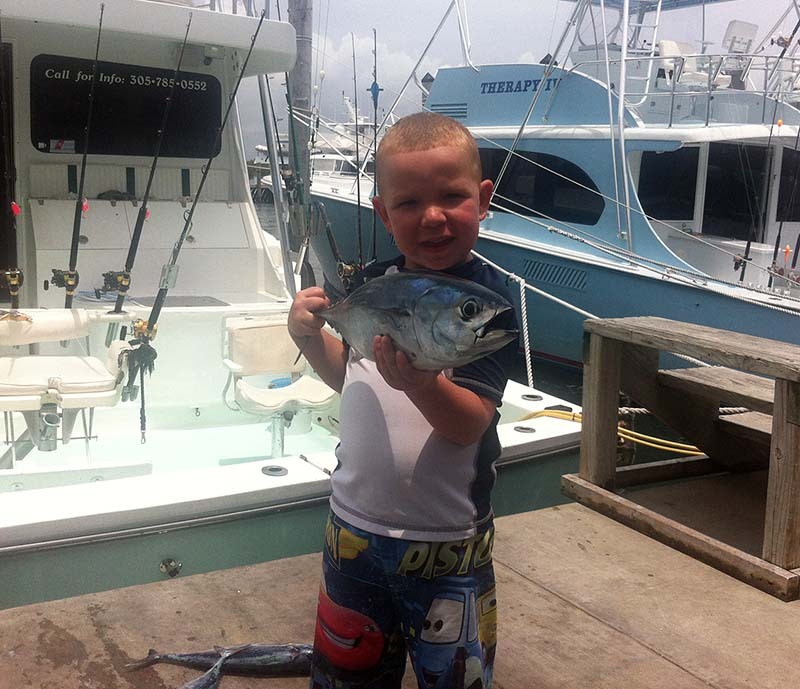 If a child has GREAT first experience sport fishing, they will love it their entire life. Teaching the youth of our sport is vitally important. Having them learn patience, hard work, respecting nature, enjoying success and handling defeat. These are just a few lessons learned when taking your kid fishing on the SPELLBOUND. Corporate events in Miami are usually a few boats going out on a day of fishing. It is fun but there is not much comradery between the boats. With the SPELLBOUND we can take up to 20 people in comfort in one boat. This means that the fun and the good times you have when fishing with us you can share with all of your co-workers.Whether this is a team building exercise, a day out entertaining clients or rewarding your employees for loyalty or a job well done, with our boat and professional and experienced Captain and crew your next corporate event experience will be one that your workers will talk about and remember for a lifetime. The Haulover Sandbar is an area of very shallow water that during low tide forms a small island that emerges from the depths. The sandbar is only accessible by boat and the SPELLBOUND offers sandbar excursions daily. During the weekdays it is quiet and you could be one of the only people on the island but during the weekend there is a party with many boats and people. No matter which you want, a quiet time or a party time, the SPELLBOUND offers sandbar excursions to meet your needs. Bachelor Party Fishing has never been easier. The SPELLBOUND is the largest charter fishing boat in Miami and can fit parties of up to 20. Bring the whole wedding party or just the boys or girls for a fun-filled day. We are not a typical drift fishing “Party Fishing” boat but rather we are a sport fishing charter boat and we can take you out to hook Swordfish, Marlin, Sailfish, Mahi-Mahi and more.Captain Jay and Manny and the friendly crew provide everything to have your day with us as much fun as possible. All you need to do is bring the beer and food or if you would prefer we can provide that too. For those that just came for the party and do not want to fish or when you want to get out of the sun, the SPELLBOUND has a full galley with Wi-Fi, Bluetooth stereo and HD flat screen TV all in air-conditioned comfort. Your Bachelor Party Fishing will be an experience and memory to last a lifetime. Are you a television show or advertising network looking to produce TV Video Production then you need not to look any further than the SPELLBOUND. With our size, the largest in Miami and able to take 20 passengers on board, we can accommodate your whole crew and equipment.Our Captains, Jay and Manny, have a combined 60 years of experience in the charter fishing industry and are perfect guides for your TV Video production. They know how to entertain and teach you how to fish and about deep sea fishing in general. Miami and Miami Beach are a great place for you to film your TV Video Production and the SPELLBOUND with its experienced and friendly crew and the size to fit your whole group on, is the best option in Miami. When you think of fishing what do you see? Many picture themselves hooking a monster Marlin and getting ready for the fight of their life! Others picture a much more relaxed day with friends or family soaking up the sun while catching fish. No matter what you dream of you will never forget the first fish you catch. That thrill of hooking it, the time and energy used fighting a tug of war, reeling it in finally and getting it on the boat and taking that trophy picture for your wall to show all your friends. This thrill will be a memory you will not ever forget and from the minute you caught it you will be hooked on fishing for life. Fishing in Miami is great fun. With its close proximity to the warm waters of the Gulfstream, the waters off the coast are some of the best saltwater fishing in the world. 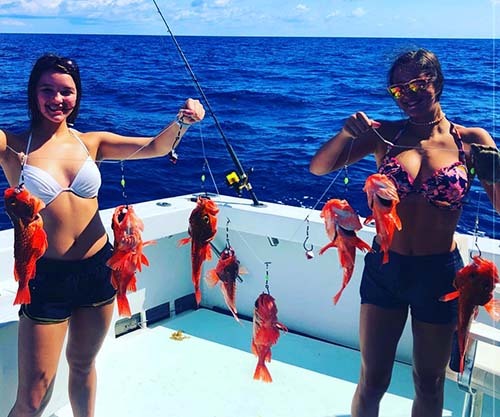 You can go offshore to the deeper waters to try to land one of the many trophy fish or come closer to shore and fish the many reefs and wrecks for a multitude of fish.